47 Ronin has received many terrible reviews. On Metacritic, its score was 29 (out of 100, for those sensible people who don't care about review sites that aren't, obviously, this amazing one right here.) I assumed it was going to be so awful that I would spend most of it composing mean tweets in my head, should I ever see it. And then I scored some free tickets, which meant that I could see it, with no guilt. Score! Keanu Reeves plays Kai, a "half-breed" found almost dead in a river as a youth and brought up by the compassionate Lord Asano (Min Tanaka), though all around him treat him badly apart from Asano's daughter, Mika (Ko Shibasaki). The town they live in is visited by the Shogun, who is accompanied by a rival lord, the constantly smarmy Lord Kira (Tadanobu Asano). Kira has dire plans for the town, however, along with the magical, nameless shapeshifter played with absolute alarming creepiness by Rinko Kikuchi, whom I will love forever after being in Pacific Rim. After manipulating the event and causing Lord Asano to commit seppuku to restore his now-bad name, the town's army, left as ronin--masterless samurai--decide to fight for Asano's honour, despite the quest meaning certain death. About halfway through I leaned over and whispered to Chris, "What is everyone talking about? This is a perfectly serviceable movie!" At the end, I cried. (Don't read the Wikipedia entry on the true story of the forty-seven ronin, it is spoiler central.) This is a movie that had a good pace, knew how long to make the action scenes without giving the viewer fight fatigue, was populated by a large amount of handsome male actors with long hair (swoon), and never once made me look impatiently at my watch. The acting was all marvellous--Keanu wooden as per usual but it works as a stoic samurai-type--and it even passed the Bechdel test, with both Rinko Kikuchi's witch and Ko Shibasaki's Mika princess tough as nails. Of course it has flaws: it's a Japanese myth made by Hollywood, with Reeves as a half-breed when there was no such person in the original story. It's frustrating, because Hollywood is so obsessed with white people saving the day in every nation, and Reeves' closest tie with Asia is being one-quarter Chinese-Hawaiian (Hawaii having a large Japanese influence, however.) At least the rest of the cast were Japanese and not from a variety of unrelated Asian countries *cough*Crouching Tiger*cough*; also, Asano's 2IC, Oishi (Hiroyuki Sanada, my boyfriend from Sunshine) is just as much the hero, and mostly more useful, than Kai. The one ronin who is more big-boned than the rest supplies comic relief through his weight alone, which also feels out of place. The Japanese witchcraft doesn't add much to the tale, so could be done without; one frighteningly large silver samurai is mysterious right until it is unmysteriously dispatched but without an explanation for its origins. Also, that all-over-tattoo dude from the posters has like one line and ten seconds of screen time, would it have killed advertisers to put Sanada or Shibasaki on it? Jeez. But kudos to the filmmakers for staying fairly close to the bones of the original story, for totally surpassing my low expectations, and for the most un-Hollywood ending I've seen in a long time. 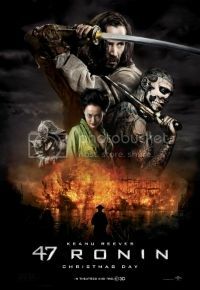 I give this 47 out of 70 Ronin.